Within the project “Partnership for Quality Jobs and Competitiveness”, financed by the European Union (under the call “Support to Local Employment Partnerships in BiH”, implemented by the International Labor Organization), which is implemented in the Municipality of Prnjavor, the research was conducted on the opinions and intentions of graduates of the Centre of Secondary Schools Ivo Andrić Prnjavor. 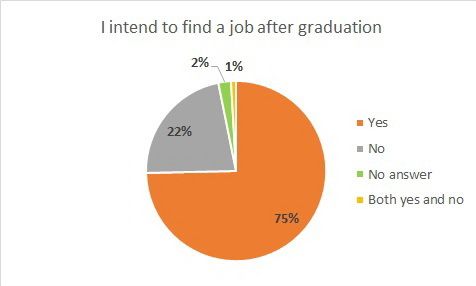 Even 75% of graduates plan to search for a job immediately after graduation. 29% of high school graduates plan to enroll a faculty, while a quarter of high school graduates who plan to enroll a faculty also plan to search for a job during study. There are 80% of graduates who are interested in attending a training on active job searching. There are only 26% of them who showed an interest in attending training on work in industry, while almost half of them have not graduated courses in regard to industrial occupations. In the next period Eda will, in cooperation with partners and companies from the Municipality of Prnjavor, conduct selection of candidates for training designed in accordance to identified needs of companies. The best of them will have opportunity for employment in industrial enterprises.